Josh Bills Gets his PJKoenig on! Back in October of 2015, I took the trip of a lifetime to the amazing Cabot Links and the new Cabot Cliffs course. My partners in crime for the trip were Ashley Mayo, Jeff Blind, and Jeff Filer. Ashley and the Jeffs are arguably some of the finest playing partners on the continent. Cabot Links is also some of the finest golfing property on the continent as well. On the second day of golf, amidst the swirling 35 mph winds, the sun popped through the clouds creating the crepuscular rays you see in the picture below. Not being a group to miss a fantastic photo opportunity, Jeff Blind captured the shot like a seasoned National Geographic photographer on assignment. Although we had already captured what could be argued as the golfing photo of the year, we proceeded onwards and captured another gem only a day later. After hitting our tee shots on the magnificent 16th hole at Cabot Cliffs, Ashley Mayo went slightly over the green. Just 2 yards further and Ashley's Titleist would have plummeted 50 feet down into the rocks, waves, and man eating sharks below. Fortunately for all parties involved, we captured her par saving chip on the photo below. This shot would end up inside of a foot. The story does not end here folks. In fact, this is where the story begins. Weeks later, an artist named Josh Bills would enter the situation. He had seen some of the pictures from the trip and was interested in turning them into works of art. I was very excited to see what Josh's talents could do. Having grown up in Ohio with a passion for the game, Josh has taken his talents from the golf course to the golf canvas. Blending his love of golf architecture and fine art, Josh is able to create amazing oil on canvas paintings of golf courses. His work has been commissioned by famous golf courses to adorn their hallways and he was going to turn the the pictures we took above into paintings. It was truly an honor. Josh works mostly at night and documented the process along the way. As the magic unfolded on the canvas, he kept me updated with his progress. 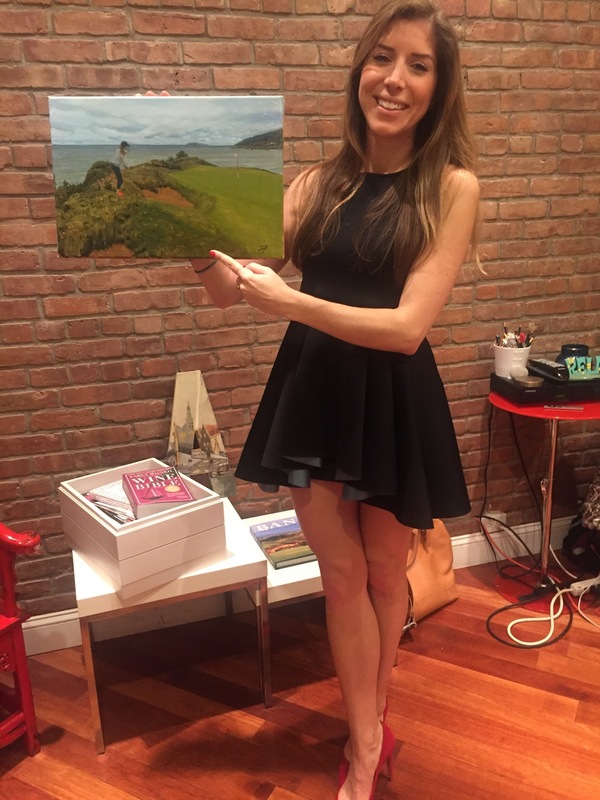 Ashley Mayo gets dressed up to pose with her original Bills! The final works of art are best experienced in person and are truly fantastic. A big thanks to Josh for immortalizing Ashley and I on canvas. These pieces will be on our walls for years to come! If you are interested in owning your very own painting by Josh Bills you can visit his website, contact him directly at jrbgolfs@gmail.com or give him a call at 614-284-3155. Here is also a link to all of Josh's paintings that are currently for sale. To learn more about the man behind the art, check out his recent interview with Graylyn Loomis.